Today’s digitally connected world has made customers more aware, socially engaged, informed and demanding. As we observed in our July 2018 blog post, “How to Improve Customer Experience Using a CRM System,” customer experience (CX) is the main reason consumers choose one brand over another. And a customer relationship management (CRM) system is an essential tool for staying connected to customers, streamlining processes and improving profitability. Even small businesses now have access to CRM technology that allows them to connect with customers. 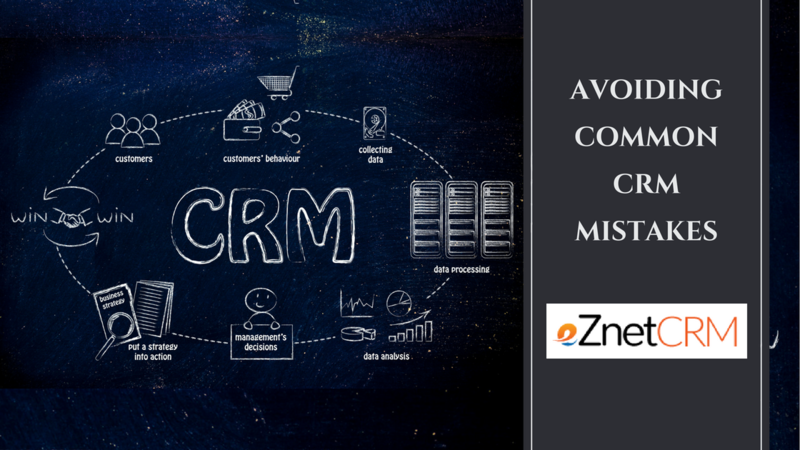 However, the CRM selection and implementation processes present many opportunities to take a serious misstep that can negatively impact the effectiveness of a CRM solution, making it more of a liability than an effective tool. Here are the most common mistakes, as noted by industry experts. Not involving your end-users at the outset – Ultimately, your employees are the end-users who have to adopt the system, so they should know from the start the purpose and goals of CRM software – as well as your company’s specific plans for utilizing it. Identify the stakeholders from each team and make sure you involve them in the CRM software selection process and in the pre-implementation analysis to provide ownership of the project. Getting feedback about the CRM solutions being considered is essential, as your employees are less likely to make the best use of it if they don’t like its interface and/or functionality. Lack of support from the C-suite can also undermine the success of a CRM solution. Stephanie Schwenn Sebring, writing for Cues – an industry group for credit union professionals – identifies other pitfalls, including isolating CRM selection and implementation to one department and not involving all stakeholders. Sehgal says, “IT tends to get focused on the nuts-and-bolts of putting in CRM systems, but when it comes to the outcomes and what everybody wants, they often struggle to develop a strategy. You want to bake those kinds of requirements in upfront, so you can design appropriately.” Not doing so can mean lots of expensive reworking later. Absence of ownership – If no single individual is put in charge of the project, implementation will be difficult and the CRM solution is likely to be underutilized – resulting in a waste of money on the software itself, and from the loss of revenue as the result of your sales team not being as efficient as they could be in converting leads and retaining customers. Relying solely on your IT department for implementation will not see the kind of success you expect from the software. The project head should be someone who understands the sales and servicing process so they can map those processes to the CRM tool. This will help ensure that your sales team uses the system to the best of their abilities. Having one person responsible for the project also gives sales team members a single source for definitive answers and solutions. Training format is important. Depending on your organization’s size, an initial group introduction and training session may be appropriate, followed by smaller team-oriented groups. Also depending upon your organization’s size and culture, additional training may take the form of webinars or other type of interactive online instruction. Selecting CRM software that can’t scale – Never make the mistake of selecting a CRM system with only your present needs in mind. As a business matures, it becomes critical to have the necessary support of scaling with growth. When that is possible, it becomes easier to manage the sales process. For example, eZnet CRM’s cloud-based solution provides the expandability to increase computing resources to keep up processing speed for larger amounts of data, increased storage space and applications that can keep up with demand. Making price the main or only selection criteria – There is no doubt that price is an important consideration for organization across all verticals, and makes a difference – especially for a small or medium-size enterprise. However, the cheapest isn’t necessarily the best solution. A budget-priced CRM solution may lack the features and functionality that would make it intuitive and user-friendly for your sales team – and therefore, less likely for them to value as a business tool and adopt. Again, if your sales team won’t use the system, it isn’t a bargain at any price. During your search for a CRM solution, we’d like to show you what eZnet CRM has to offer. Our cloud-based application is intuitive, user-friendly and provides a 360-degree view of all your customers to give your sales team the powerful insight it needs to improve the customer experience and give your business the competitive edge. Contact us to learn more, and start your free 30-day trial.